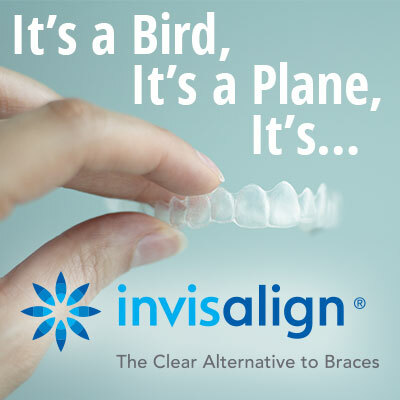 Home › Dental Health › It’s a Bird, It’s a Plane, It’s…Invisalign®! If you have a crooked tooth, odd spaces between your teeth or a poor bite, you might be considering all of your orthodontic options. Orthodontics is a specialty in dentistry that realigns your bite and teeth for the best possible look and function. Did you know that our ancestors actually had naturally larger jaws? This meant they had more room in their mouth for all of their teeth to fit comfortably. But over time, due to genetic changes, human mouths are smaller than ever before. One out of every five people will have a problem with how their teeth fit and line up in their mouth! Invisalign® is one great option for the modern human who wants straighter teeth, without unsightly metal brackets and wires. If for any reason you aren’t fully comfortable with your smile, Dr. Milligan in Incline Village wants you to know your options. Read more below about orthodontics and Invisalign. When your mouth is closed, your top teeth should rest comfortably on top and a little to the front of your bottom teeth. This resting position is called your bite. If your teeth don’t come down at a good angle, it might be because you have an improper bite. An improper bite, called malocclusion, is sometimes just cosmetic, but it can cause pain and difficulty eating or speaking, as well as problems with the jaw joint (TMJ). If your teeth are out of place, it can affect many aspects of your life. You might have head and neck pain, trouble eating or speaking, or feel shy about your appearance. Crooked teeth also increase your chance of developing tooth decay and gum disease because it’s harder to clear debris even with regular brushing and flossing. There are many ways to move your teeth and bite to into a better position. All orthodontic treatment requires careful planning, time, and may cause a bit of soreness. You are moving real bones, after all. Orthodontic treatments involve some kind of metal or plastic in your mouth that will apply just the right kind of pressure to shift your teeth over time. This is called an appliance and it can either be removable or cemented in your mouth. The Invisalign treatment is able to achieve the same results as conventional metal braces but without the ugly metal braces! Instead, Invisalign uses a series of clear plastic aligners to apply pressure and gently shift teeth into their desired location. Invisalign uses plastic aligner trays instead of metal brackets. The aligners are removable, so even though you need to wear them for most of the day (20-22 hours) you can actually take them out for eating, cleaning, and for special occasions. Regular braces are permanently cemented in place. You will get new Invisalign aligners approximately every two weeks. Each set will be slightly different to slowly move your teeth into a better position. Removing Invisalign aligners makes oral care, like brushing your teeth, easier than if you have metal braces for better oral and periodontal health. Invisalign may work best on simpler cases but it can often work faster than braces. It’s never too early (or too late) to achieve optimal oral health. Having a proper bite and a confident smile can improve nearly every aspect of your daily life. Your Incline Village dentist can give you a professional consultation and even create a flexible payment plan to help you get the orthodontic treatment you deserve. If you have questions about Invisalign or any other orthodontic options, contact Incline Dental Care today! We’d love to give you something to smile about.